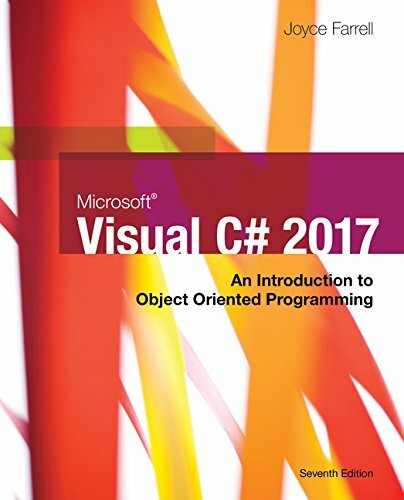 1337102105 -Guide beginning programmers through the fundamentals of the C# language using its most recent features with Farrell’s MICROSOFT VISUAL C# 2017: AN INTRODUCTION TO OBJECT-ORIENTED PROGRAMMING, 7E. Approachable examples and a clear presentation help students build a strong background in both structured and object-oriented programming concepts. Students master critical fundamental skills that easily transfer to other programming languages. This edition incorporates the most recent versions of both C# and Visual Studio to ensure students have the latest skills necessary for professional success. Hands-on features, video lessons, new debugging exercises, programming exercises, and running case studies keep students actively engaged. Now available with MindTap, the digital learning solution that powers students from memorization to mastery. Give your students hands-on skill practice with auto-graded lab assignments in a live integrated development environment directly within MindTap. A full selection of instructor support provides the tools to reinforce the solid programming skills your students need.